When it comes to healthy-looking skin - the pomegranate offers some amazing potential! When used in a lotion like this selection from The Naked Bee - pomegranate can help hydrate, protect and nourish skin. It has even shown the ability to promote the production of colagen and elastin for skin that looks youthful and radiant! Pomegranate Honey Moisturizing Hand & Body Lotion from The Naked Bee is also made with organic aloe vera, sunflower oil and other all-natural ingredients. It's skin care the way nature intended! The Naked Be never uses dyes, pigments or artificial fragrances. There are no parabens, mineral oil, drying alcohol, lauryl or laureth sulfate. Only the purest ingredients from Mother Nature go into this lotion. Choose Pomegranate Honey Moisturizing Hand & Body Lotion from The Naked Bee! When I first opened the bottle, I did not like the smell at all. Since I did not have any other body lotion, i still used it before going to bed. In the morning, my husband complained that he could not sleep for the whole night because of the way I was smelling! What a good effect I made...!. I did not want to throw the bottle away so I still used it during the day, however, it gives me headaches when I smell my hands... not fun... . I work as a nurse in a busy ICU and Unscented Hand and Body Lotion is wonderful! We all love the smell and the great way our hands feel after using it! And it LASTS!! With all the hand washing we do....that is a big plus!!!! Love the scent, feel of this lotion. Not a greasy product, goes right into your skin. With all the antibacterial soaps in the offices, this is a great lotion to use. I love love love my Hand and Body lotion. I use it every single day. This is great for your skin with no parabens, drying alcohol, and much more. This product is so good (for your skin) that you can actually safely put it on your face! This has all the good and none of the bad. Also, this product has an amazing smell. Purchase this and you will never use another lotion again! Orange Blossom Honey Pump Hand & Body Lotion is non- greasy and non- tacky. Works well on dry winter skin. Pleasing smell almost alluring. Reminiscent of those little black incense cones. Pump bottle is convenient. I have passed this around at work and everyone wants to know where they can get it. Its not greasy and smells very good. Orange Blossom Honey Hand & Body Lotion is the best lotion i've ever tried?on all counts!! Everyone that smells it wants to know what it is. Love this product!!! The scent is AWESOME! It makes me happy & feel energized. Orange Blossom Honey Hand & Body Lotion goes on smooth and soaks right in. Love it. Orange Blossom Honey Pump Hand & Body Lotion is the. best. ever. Light, pleasant fragrance, works in quickly - not greasy! Moisturizing effect lasts a long time. When it's lambing season and I wash my hands 20 times a day this lotion is essential!! Love it! Best lotion I've ever used! Energizing scent. Thick and creamy without being greasy or oily. Simply fabulous! To me this lotion smells like liquid Smarties. It is the most moisturizing feeling lotion ever and is never greasy. Love Naked Bee more than other bee brands. This is by far the best priced, reliable site to order from. Awesome for hands! Not recommended as an all over body/face moisturizer, for me, because I prefer a more silky/soufle/body butter texture, and I think the bees wax has qualities best suited for the tougher skin on hands, to help retain moisture after hand washing throughout the day. 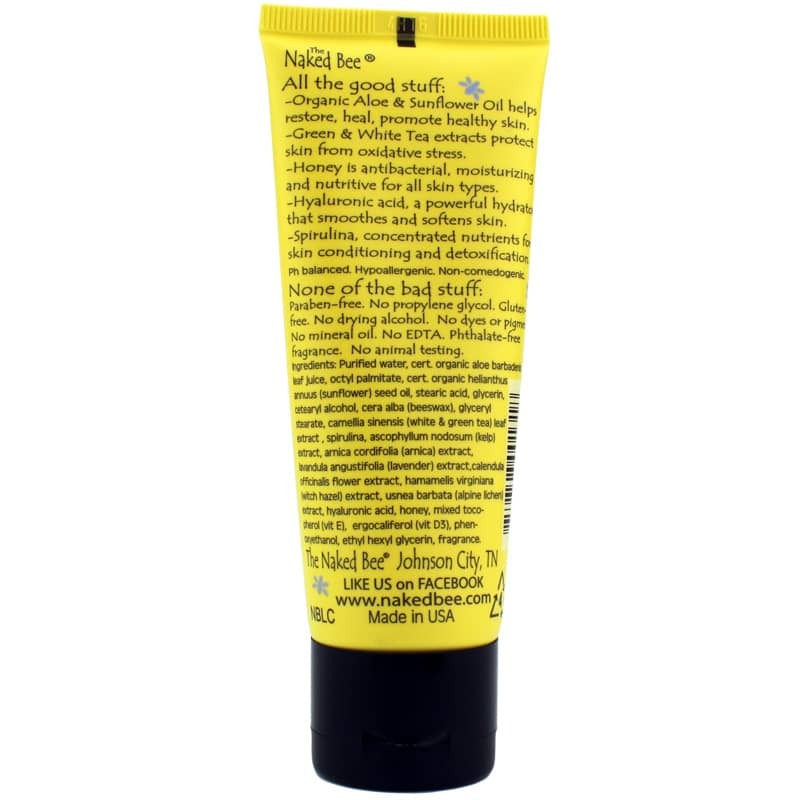 Naked bee is by far my favorite hand lotion to have multiple tubes of around the house, at work, and in the car. I have turned more than one family member and friend into fans! This is a wonderful product!! I ordered several To cut down on the shipping. Love love love This lotion !!! The best natural hand cream!!! orange blossom honey lotion smells amazing!!!! none of those nasty chemicals added!!!! you will love this!!!!! I love this fragrance. It does not irritate me, and keeps my skin from drying in this dry climate. I found this cream while shopping in Asheville, NC. I liked it so much I ordered more when I returned home. Orange blossom honey lotion leaves the skin feeling silky soft. great product....ingredients, scent, consistency.....are perfect for me! This Naked Bee lotion is like my own personal feel better potion. It smells fabulous and just makes my skin feel silky. I love it on my legs and arms after I've showered. I love this lotion. It's very rich and smells delicious. If you like lavender, this is your lotion. I also love that the list of ingredients is great, no chemicals of any sort. Love this cream. Not greasy & smells great.